Many years ago, while handbuilding a large form, ceramic artist Marcia Selsor was struggling to support two slabs that she wanted to join at right angles. So, she set out to build a custom tool to serve this purpose: a right angle jig to support the form in progress. The jig is a simple plywood structure that supports two ware boards at a right angle. Slabs are then placed on them and held in place during attachment. Over the years, it has proved to be an invaluable tool when building architectural or geometric forms, such as corbels, square tops of capitals or square vessels. Today, she shows us how to make and use her right-angle jig. Take it away Marcia- Jennifer Harnetty, editor. Begin with two pieces of 1/2-inch plywood cut to 12_15 inches. Cut a right angle shape out of each piece. To connect these notched ends, cut two 15-inch-long braces and one 14-inch-long brace from 4-inch-wide plywood boards. Attach the braces to each side and the middle. This post is excerpted from Ceramic Sculpture: Inspiring Techniques, which is available in the Ceramic Arts Daily Bookstore. Two sheets of plywood complete the jig (image 1). Cut out all the clay pieces during the same session and store overnight on sheetrock or gypsum board under plastic. Tip: Design tarpaper patterns then cut and press them onto the slab. Use tarpaper patterns much like sewing patterns but plan for the thickness of the clay. Store and reuse tarpaper patterns (image 2). Use a 45° bevel cutter to cut the edges of the shapes that will later be joined at right angles. You can also use a cut-off wire held tightly and pulled along the edge, or a fettling knife held at a 45° angle. On the second day, or after the slabs have stiffened, score and slip the edge of one and place in the plywood cradle. Score and slip a second slab and slide it down to meet the edge of the first slab (image 3). Fill the seam with a coil and smooth with a rib. To remove, tilt the whole works and slide the boards and slabs onto the table. Gently pull the boards away from the clay, which should stand free (image 4). After joining the remaining two sides, attach the bottom, then attach the other assembled sides to complete the basic form (image 5). Remove from the jig and finish the exterior seams the same as the interior seams. To work on the top and bottom, sandwich the form with bats and flip it over (image 6). Finish the surface with ribs or a Surform tool (image 7 & 8). clay, fettling knife, rib, set, slip. Wish the photos had been a little larger, but nice helpful tip. BTW, shouldn’t plywood be sealed or painted to avoid any surface pattern issues? Darryl – there is no need to seal the plywood – as the pattern will only be transfered to the clay if the clay is rolled out on the wood – sealing the wood may hinder drying. I would really like it if it were possible to leave photographs of ceramic examples for your collection. I have made geometric sculptures for years using what I call “instant stiff slabs”. I roll my tar paper pattern onto the clay with a slab roller. It can be stored or assembled immediately. The tar paper acts as an external armature. I cut the appropriate angles on the seams, scratch and join. The ‘cut’ seam pieces are a perfect fit for “noodling” the inside seam. The tar paper remains until the clay is firm enough to be removed. Thanks for the comments. I slide the two pieces of the two joined sides out of the jig , stand them nest to each other to join the four sides together. Then I put the whole thing back into the jig and work on. The inside seams. I do use newspaper print end rolls for working with slabs on boards or Sheetrock but in the first steps they are on the tar paper templates and slide easily. To stand up the two joined pieces, I tip the whole thing and slide the clay to the table top and stand it up. It had to be stiff enough to stand. The boards are not joined together because the slabs are flipped onto the boards from the slab roller. That reduces warping because they remain on boards and never picked up when wet. This is something I have been putting off making for a long time. But I’m going to figure out how to make a hinged one so I can adjust the angle, with wingnuts to lock it off! Sometimes I get so tripped out making clay-tools, I forget to unwrap the clay….. I wish there were some shots of the best way to pick up the first two joined pieces to put them on the other two without breaking the joint. I think if I try this I will start out much smaller than this demo piece. Marcia is such a grat asset to the pottery community. Thanks Marcia for freely sharing your ideas with us. Depending on the size of your joined pieces, an easy way to pick them up is with another piece of wood cut to the same 90 degree angle. This could be a 4×4 or two pieces screwed together to form an L. Place this piece on the interior of your slabs when they are stiff enough tilt the slabs forward and lift them into place on the ones resting in the jig. This looks like the form I use for stabbing holes in signatures and pages for book making…very clever…hadn’t transferred that knowledge on my own. Thanks! Thanks for this GREAT tip! I am going to build this jig and make many slab built pots with it. 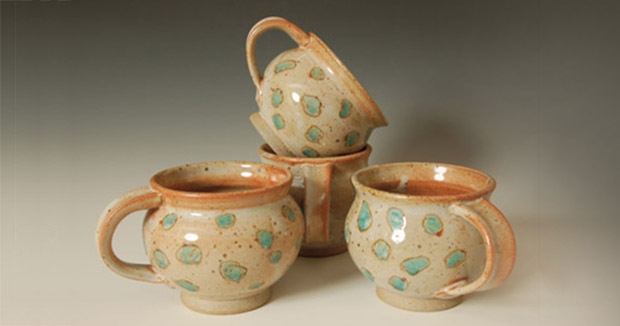 Once again, the pottery community owes thanks to Marcia’s contributions! I can only add that putting newsprint between the clay and ANY surface prevents potential sticking. Also, as the clay shrinks, it and the newsprint move as one, while plywood/sheetrock/whatever don’t move, and the clay may warp as it shrinks.